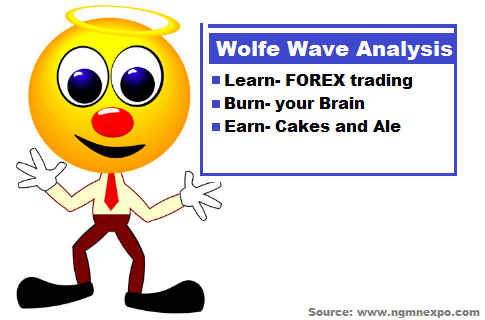 FOREX TRADING GUIDE: HOW TO CONDUCT WOLFE WAVE ANALYSIS ? HOW TO CONDUCT WOLFE WAVE ANALYSIS ? yourFXguide-We already know the Elliott's Wave analysis where he proposed five impulsive waves and three corrective waves in the market cycle. Elliott's Wave Analysis is aimed to understand the market behaviour. Wolfe Wave Analysis is different than the wave analysis proposed by Elliott. With Wolfe Wave Analysis traders can trade reversal and continuation. In a candlesticks chart when a price action chart pattern is formed like symmetric triangle, rising or falling wedge and rising and falling channel, they are the result of war between demand side and supply side. And when the breakouts of the patterns take place, we find the winner of the war. I am talking about the price action chart patterns here because Wolfe Wave Analysis very closely related to these patterns formation. And some of this chart patterns like widening triangles and widening wedges can be traded more accurately with Wolfe Wave Analysis. Wolfe Waves formation is not an innovation rather a discovery, and it is a naturally formed pattern. Wolfe waves formation explains a fight for balance, equilibrium, between demand and supply. Wolfe waves can be formed on the charts of any time frames from minute charts to monthly charts. In above illustration, bullish wolfe waves are formed. We can see wave-3 and wave-4 are within the channel created by wave-1 and wave-2. Wave-5 is a little lower than the channel created by the followed waves. This is called the false breakout, which the first bullish entry signal. In second way another entry signal is found when the channel breakout takes place. The green line in the above illustration is called the target line which is the line where the market supposed to reach. In above illustration, bearish wolfe waves are formed. We can see wave-3 and wave-4 are within the channel created by wave-1 and wave-2. Wave-5 is a little upper than the channel created by the followed waves. 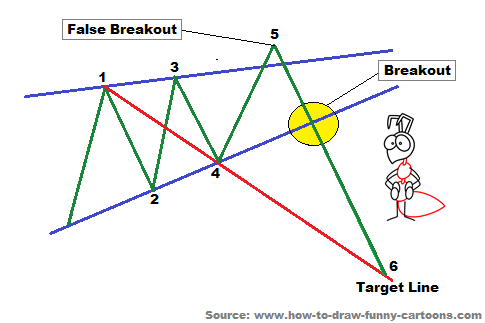 This is called the false breakout, which the first bearish entry signal. In second way another entry signal is found when the channel breakout takes place. 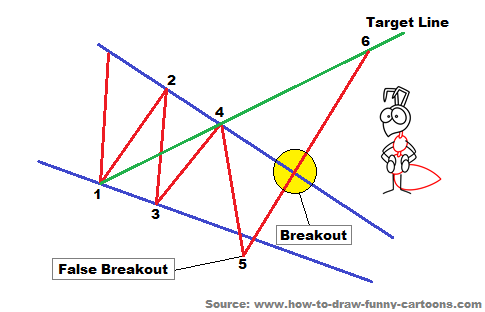 The red line in the above illustration is called the target line which is the line where the market supposed to reach. The target lines on the above illustrations can used to find the profit target for the orders placed at any of the breakouts. The stop loss can be placed at the previous support or resistance level or at 20 pips lower or upper than the entry level. (a) Waves 3-4 must stay within the channel created by waves 1-2. (b) Waves 1-2 equal waves 3-4 (showing symmetry). (c) Wave 4 revisits the channel of points established by waves 1-2. (d) There should be regular timing intervals between waves. (e) Waves 3 and 5 are usually 127% or 162% (Fibonacci) extensions of the previous channel point. Dear Traders,This is the first post about Wolfe Wave Analysis on youFXguide, but I will come with more posts on the same principle but on real price chart to explore it in details. If you have any question regarding this post, you can drop it into the comment section below. I generally respond to your comments within 24 hours.